It was in Bruinsma's musical compositions that his brilliance was most displayed. “Henry’s personality was … embodied in his music: colorful, radiating charisma, magnetic in a nonverbal way,” niece Jane DeGroot said. Bruinsma displayed musical potential even before he was considered old enough to take music lessons, said his wife, Grace Hekman Bruinsma. The preschooler would eavesdrop on his older brother’s piano lessons. After the teacher left, Bruinsma would climb onto the piano bench to practice his brother’s lesson assignment. Later on, he chose to attend Ottawa Hills High School in Grand Rapids, Mich., for its music program. Following high school graduation in 1933, Bruinsma attended the University of Michigan for a degree in music. He stayed on to complete a Ph.D. in musicology, becoming the first musicologist to graduate from the University of Michigan. It was during his graduate work that Bruinsma wrote Scherzo on a Dutch Nursery Song. “He never lost his love for Dutch history or Dutch Reformed music,” Grace Bruinsma said. It was also during his time at U of M that Bruinsma began taking Grace to music concerts, and in 1939 they were married. Bruinsma began his time as a professor of music at Calvin College (1946-55). In addition to his teaching duties at the college, Bruinsma taught the first music and theology course at Calvin Seminary. He also chaired the first Conference on Liturgy of Music. However, not long after his time at Calvin, Bruinsma decided he was being called to move from teaching to education administration. Of note is his time at Ohio State University (1959-64), where he served as the director of the School of Music. He also held the position of executive committee member of the College of Education. Next, Bruinsma moved to what is now Arizona State University (1964-79), another notable mark in his education administration career. During that time, he served first as chair of the School of Music, then as founding dean of the College of Fine Arts. He is also known to have started the first religious studies program at Arizona State as part of the university’s interdisciplinary studies program. Due to the amount of time he spent in education administration, much of Bruinsma’s musical compositions were never published. 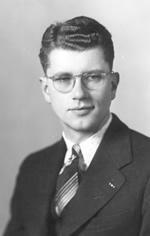 After his death, Grace Bruinsma contacted Gerry Bouma of Morningside College in Sioux City, Iowa. Bouma and Henry Bruinsma had met in 1969 at a Grand Rapids Christian High School concert in Chicago. “For whatever reason, Henry and Grace treated us like we were their kids,” Bouma said. Grace asked Bouma to catalog and publish the 10,000 pages of Henry’s material. Taking a semester sabbatical, Bouma began his work. Bouma’s catalog of Bruinsma’s work can be found in the Heritage Hall Archives at the Hekman Library, Calvin College. The Archives also hosts additional works from Bruinsma’s time at Calvin.